These are often called Giant Water Scavenger Beetles. These are a common sight on most trout streams, especially in the calm backwaters. They aren't regarded as significant to trout, although I have found them in occasional stomach samples. 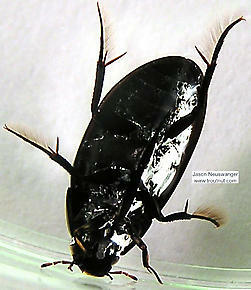 Hydrophilidae (Giant Water Scavenger Beetles) Beetle Adult View 2 PicturesThis is a water beetle. It is the hardest object in the world to pick up with tweezers. The second hardest is Mount Everest.